Friday March 30th – Thursday April 5th! 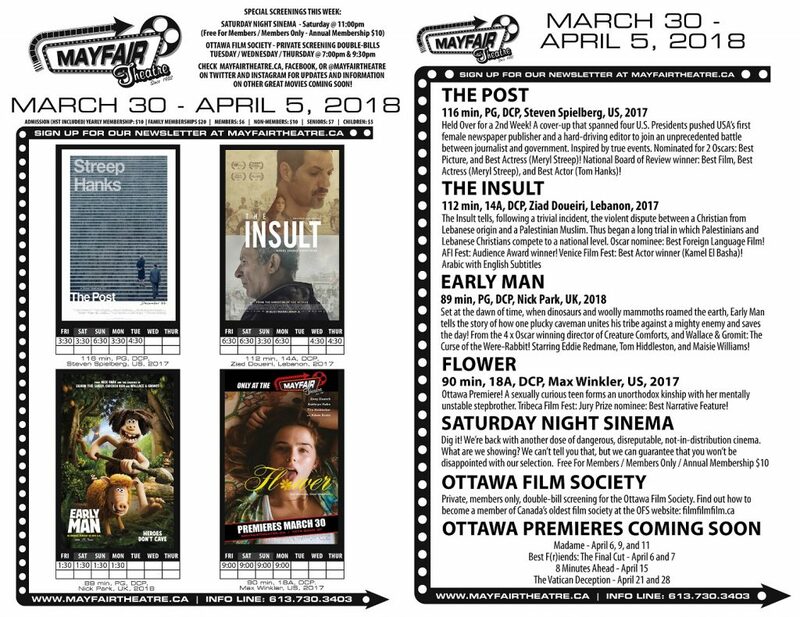 This week: 2 x Oscar nominee The Post is Held Over for a 2nd Week, Oscar nominee for Best Foreign Language Film – The Insult, the Ottawa Premiere of Flower, long weekend family matinees of Early Man, and Saturday Night Sinema! Just wondering if A Fantastic Woman will be shown again after April 12. It is hard to find! We had a run of A Fantastic Woman from March 23rd – 26th. The April 12th screening is a free event organized by the Carleton University Graduate Students’ Association. You can register for tickets at this link. We finalize bookings every Monday for the following Friday through Thursday. Besides for premiere dates listed on the main page of the website, the answer for upcoming movies besides for those is always a “we don’t know”. Though, since it already screened last month, it is unfortunately rare for a movie to make a return.